Today's highways aren't ready for tomorrow's heat waves. Image: Used with permission of WKBN-TV. When you’re cruising down the highway in an air-conditioned car, it’s easy to ignore the sweltering heat outside. But as climate change makes heat waves more common, driving may get a lot bumpier. Michael Meyer is with WSP, an engineering consulting firm in Atlanta. He says that occasional hot days do not typically cause problems. 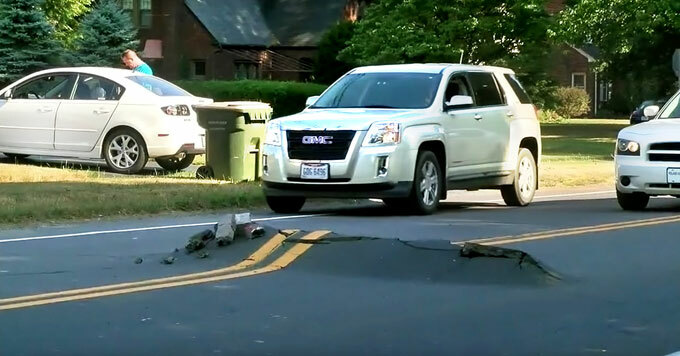 The real problem comes with extended heat waves, which can cause pavement to expand and crack. When a road heaves or buckles from heat, it can be dangerous for drivers. So to keep roads smooth and safe over the next several decades, Meyer says engineers need to reconsider the types of pavement they use, especially in areas facing longer bouts of extreme heat.